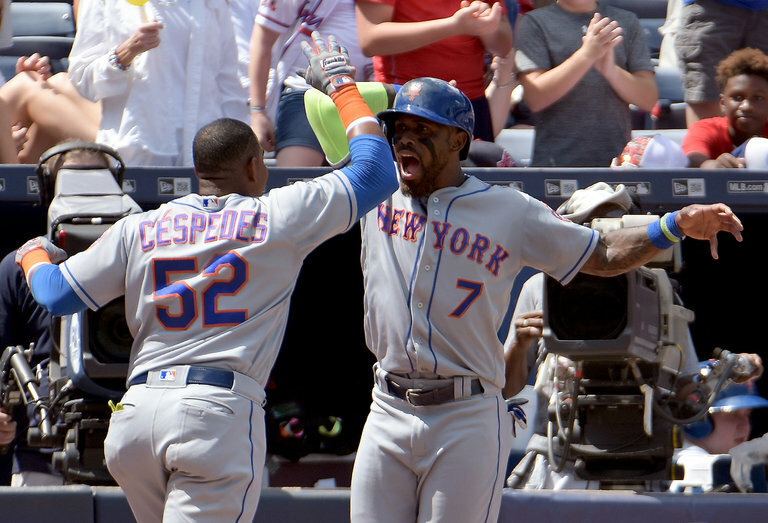 Yoenis Cespedes with Jose Reyes after hitting a grand slam in the third inning against the Braves. ATLANTA — When he was a little-known minor league pitcher, Seth Lugo made little money, netting about $200 a month, he estimated. To save money while he was playing with Class AAA Las Vegas this season, Lugo even lived with his agent’s mother. “Every year, going into spring training, my grandpa would help me out and give me some money,” Lugo said. Now a 26-year-old rookie with the Mets, Lugo wants to pitch well and aid the team’s run toward the playoffs. And with another strong start on Sunday, backed by a grand slam from Yoenis Cespedes and an explosion of 11 Mets hits over all, Lugo did just that, helping the Mets to a 10-3 victory over the Atlanta Braves that moved them back into position for a National League wild-card spot. But Lugo, who allowed two runs over seven innings, leaving his E.R.A. at 2.40, has another incentive to pitch well: He has about $18,000 left in student loans, he said.